Dimensions: Length: 2.5 Height: 5 width: 2.5 Great Gift Idea. This Grow Kit gives you everything you need to germinate and grow the world s largest living thing! Giant Sequoias are native to the Sierra Nevada Mountain Range where proud giants such as the General Sherman and General Grant trees have wowed National Park visitors for years. Giant Sequoias are hardy enough to grow well in virtually any climate and are loved and cultivated throughout the world. This truly majestic species the most massive of all trees can live thousands of years and attain monumental size up to 300 feet tall with trunks almost 40 feet in diameter. Growing a tree from seed is a magical and fascinating experience for people of all ages. 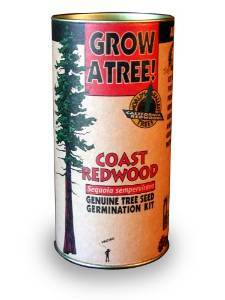 This 100% guaranteed Grow Kit provides everything you need to germinate Sequoiadendron giganteum - seeds growing medium a mini-greenhouse and detailed instructions. Our instructions lead you through the whole process - from cold-stratifying your seeds to germination to transplanting.